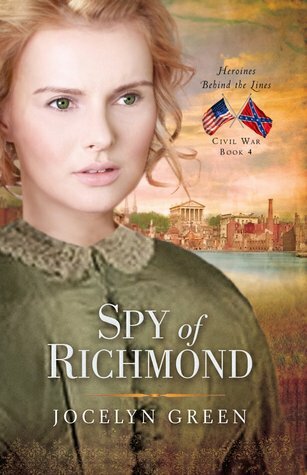 Spy of Richmond once again pulls upon Green's immense skill in weaving historical detail with fictional liberty to create a world that lives and breathes out its narrative. Readers can easily find themselves lost in streets of Richmond prior to its fall with all the sights, sounds, and emotions one could easily imagine running high in such a place. While one would expect a novel placed during the civil war to be full of emotion and adventure, I was unprepared for the depth and breadth the plot had to offer. Everything from faith and moral quandaries, courageous overtures, mystery, intrigue, love and loss. A less skilled writer could have easily found themselves overwhelmed by such a story but Green easily directs her tale into an engaging page turner with clear direction and clean readability. To my great enjoyment, unlike my previous introduction to Green's work, I found myself with a variety of well developed characters leaping of the pages in ways that were real, believable, and with the ability to endear themselves to this reader. I loved the character of Sophie Kent. While main characters are meant to carry the story, Sophie was a flawed heroine wrestling with her faith, her beliefs, her family, and her country. She had challenges to overcome but at the same time those challenges were plausible and added the human element to her character in a way that made her character take on different elements of interest. Bella was another such character. While I felt somewhat at a disadvantage not having read the first three books in this series, I do know that Bella was first introduced in Book two of the Wedded to War series. I loved Bella's fierceness as well as the way she allowed that fierceness to be channeled and shaped by her love and humility. With these two characters at the helm, Spy of Richmond had no shortage of female role models. While readers could take my path and just jump into the series wherever (as this book is seriously worth reading) there is obvious benefit to having read earlier offerings in the series first to have a fuller appreciation and understanding of the characters which shine so brightly amid such dark events. Either way, this is not a book fans of historical fiction will want to miss. "Book has been provided courtesy of Moody Publishers"